I’ll admit that when I first started writing this blog my interests were driven entirely by finding cruelty-free cosmetics and house-hold products, with only a cursory consideration for minimising my exposure to toxic chemicals. Along the way, however, I’ve become increasing concerned about the chemicals in the products we put on our bodies everyday. I still have a lot to learn and understand, but I can’t dismiss the fact that if modern medicine has accepted that medicine can be applied through skin (e.g. nicotine patches and hormone creams) then it stands to reason that any chemicals in the products we use can also travel through our skin and into our system. As I said, I still have a lot to learn about the chemicals used in products – but for now I’ve become increasingly focused on using products that are not only cruelty free, but also organic and/or have plant-based ingredients. 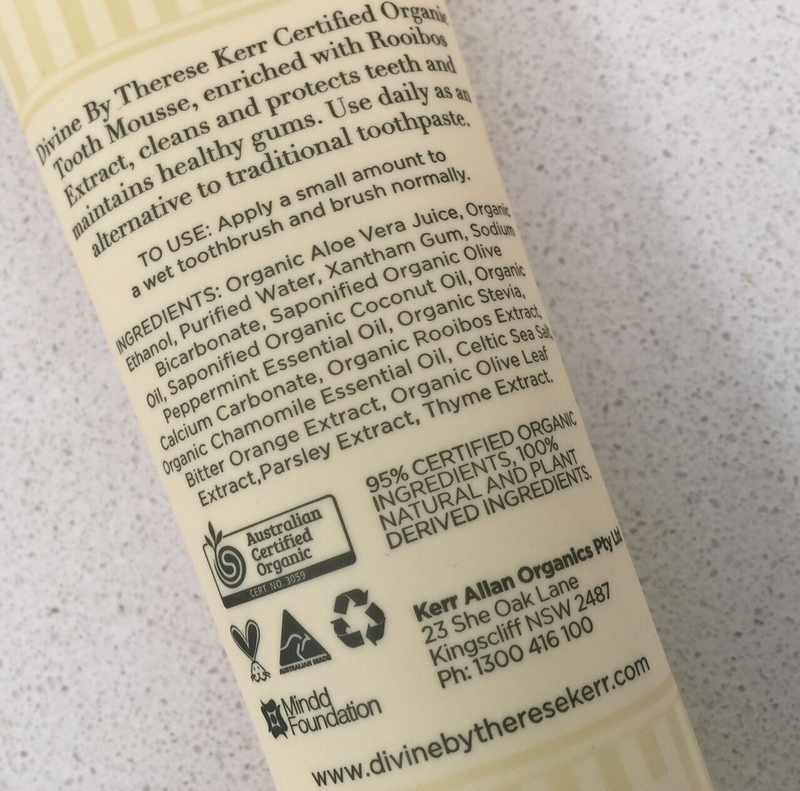 The Divine by Therese Kerr range meets that criteria, being both certified by PETA as cruelty free and Australian Certified Organic – double score! I generally opt for moisturisers when I’m trialling a product range for the first time, but I was intrigued by the dental care products so I decided to give the peppermint and chamomille Tooth Mousse a go. 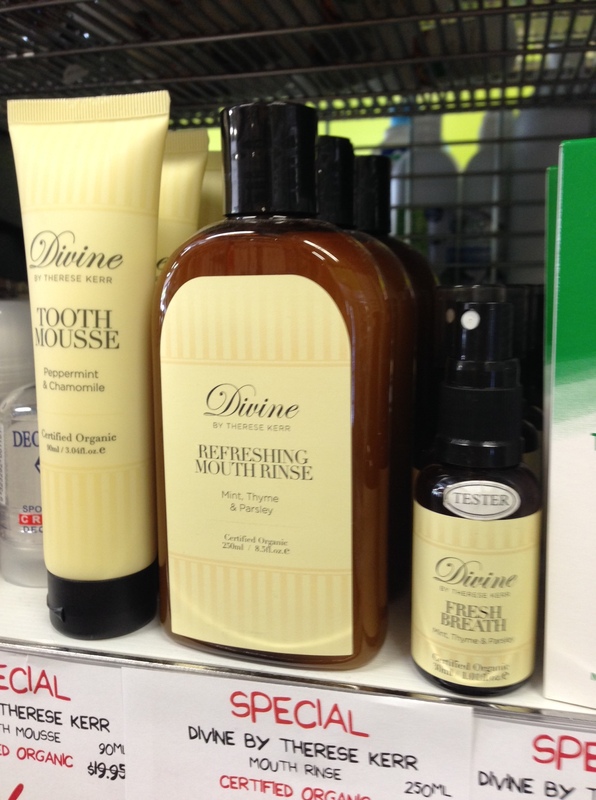 The Divine By Therese Kerr Certified Organic Tooth Mousse is a gentle, soothing & healing mouth hygiene choice. Containing the highest quality certified organic and natural ingredients including Aloe Vera, Rooibos Tea, traditional Sodium Bicarbonate, Coconut Oil combined with the pure essential oils of Peppermint and Chamomile together with Parsley and Bitter Orange Extract provide a safe and healthy toothpaste option for the entire family. 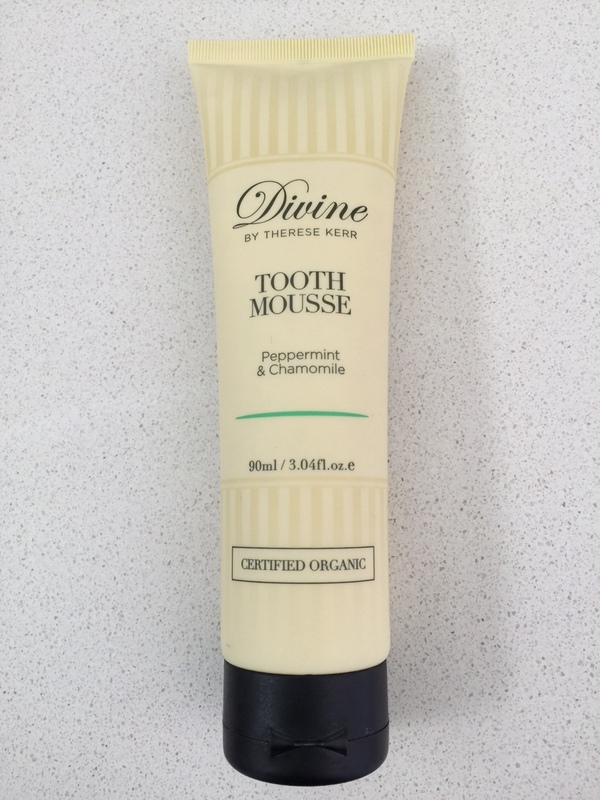 The Divine By Therese Kerr Tooth Mousse is free from the endocrine disrupting chemicals, Sulphates, Sodium Fluoride, Triclosan, Glycols, phthalates, obesogens, plus other nasty chemicals commonly found in traditional toothpastes. 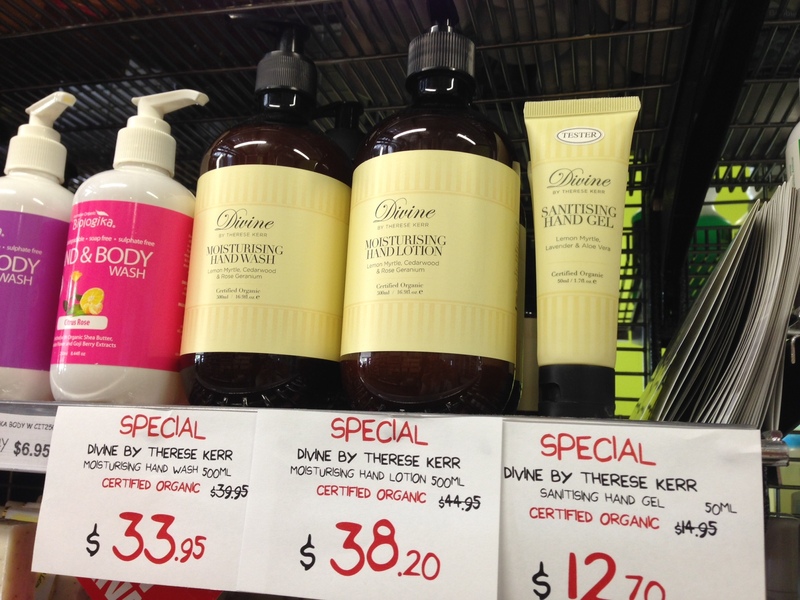 We are proud to say that the Divine By Therese Kerr products are Australian made and owned. This product is vegan and gluten free & our ingredients are not tested on animals. Second thing is the taste. I’ve been trialling a few herbal toothpastes just recently and to be honest they taste…well a little herbal! This tastes light and fresh and is actually very pleasant. Overall…I really like it and this toothpaste (well mousse!) is now a permanent fixture in my bathroom. I can’t dress up the price. With an RRP of $19.95 it is not cheap, however they suggest that it should last 2-3 months and let’s face it it’s not too high a price to pay when we’re talking about eliminating chemicals that could potentially be damaging your health. I’ll definitely be checking out more of the products from this range. There’s also a special offer on for August, buy a Moisturising Hand & Body Lotion and get a Deodorant for free – happy shopping!